Apple Watch Hermès, a unique expression of the Apple Watch, is outfitted with a stainless steel bezel and finely stitched leather. This collaboration of Apple’s industry-changing product design and the heritage craftsmanship of Hermès is available in three models; Single Tour, Double Tour and Cuff. The Single Tour with the 38 mm stainless steel case comes in Fauve Barenia leather, Noir Box leather and Capucine Swift leather, while the Single Tour with 42 mm stainless steel case comes in Fauve Barenia leather and noir Box leather. The Double Tour pairs with the 38 mm stainless steel case and is available in fauve Barenia leather and Bleu Jean, Capucine and Etain Swift leather. The Cuff pairs with the 42 mm stainless steel case and is available in Fauve Barenia leather only. So as not to be confused with any other variety of the Apple Watch, each stainless steel case features an etching of the Hermès signature and includes a customizable face with three exclusive dial designs inspired by Clipper, Cape Cod and Espace Hermès watches. 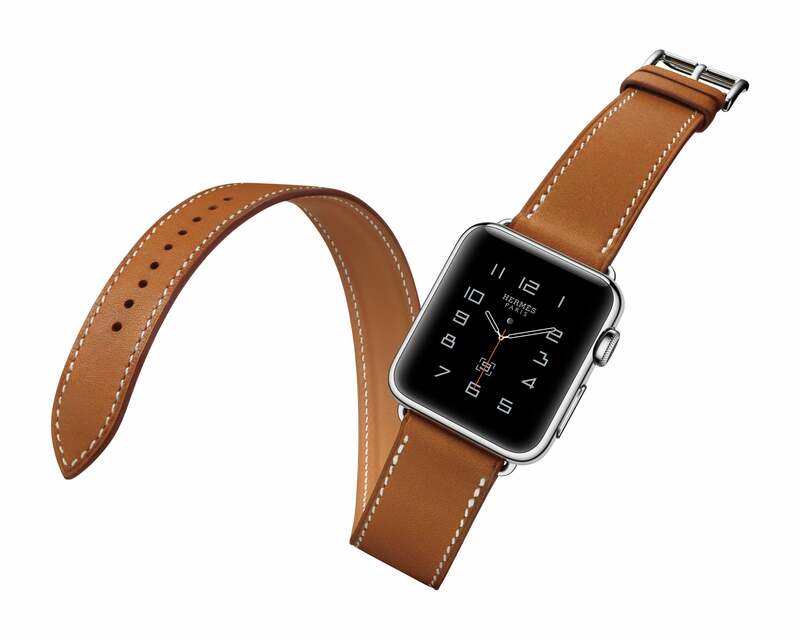 Apple Watch Hermès delivers high tech functionality and style that transcends time.